Parineeti Chopra dazzled the ramp in this Lehenga style anarkali designed by Manish malhotra. It is slit in front to add to the ease and fabulousness. Something like this is perfect for festive occasions. In yet another one of Manish Malhotra’s designs we see here Shilpa Shetty dazzling the ramp. It is a net anarkali with heavy but easy to carry bottom. The net shows just enough skin to elevate your style from simple to amazing. Something like this is bound to transform you into an elegant diva and the centre of everyone’s attention. Feeling bold? Check out these sheer anarkali’s adorned by our the gorgeous Katrina Kaif and Richa Chadhha. They have heavy, embroidered bust with simple sheerness in the rest of the outfit. They are bold, unique and all-round fabulous. They are bound to help you make a statement. Simplicity was never more beautiful than when Aishwarya Rai Bachchan wore this yellow frock style anarkali with silver, gota embroidery on the bust and the bottom. The silver compliments the yellow perfectly. Something like this is can be copied straight from her and will make anyone look just as gorgeous. Wish to make a statement? 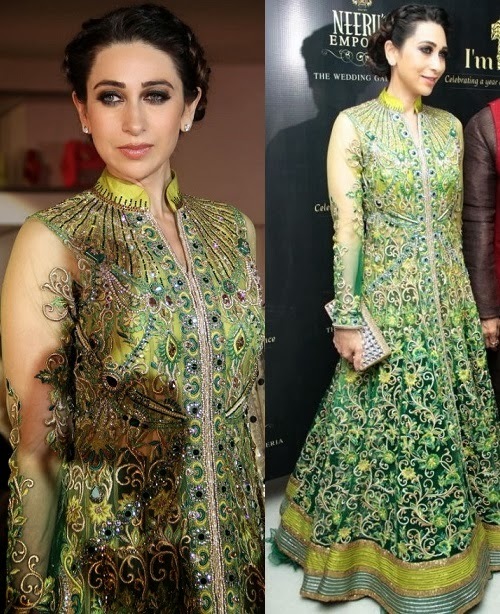 Check out this full embroidered, gown style, beautifully hued anarkali adorned by karishma Kapoor for an event. This is bound to set one out of the crowd. 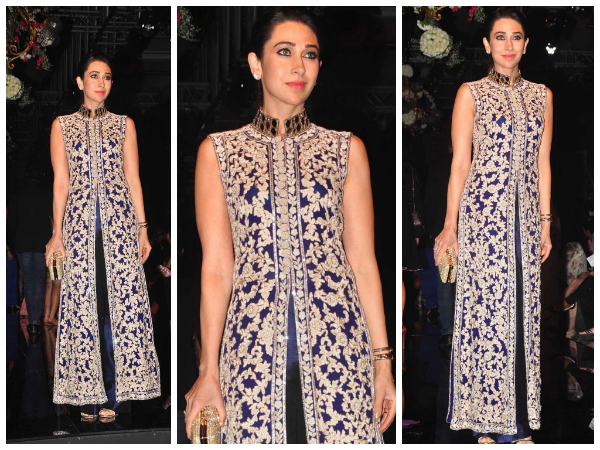 Karishma Kapoor rocks the ramp in this minimalist long-short anarkali with designer, net sleeves. It is something that will make anyone look just the right amount of elegantly perfect. The timeless grace of Deepika Padukone is only enhanced by this heavenly seeming koti-style white anarkali. The jewellery is matched to perfection. This one is a timeless piece. If you want and anarkali without the bustle, take a leaf out of Anushka Sharma’s look book and look effortlessly gorgeous in a simple yet elegant lace design anarkali. It is easy to wear and carry. Stand out of the crowd by taking inspiration from Karishma Kapoor in this gorgeous straight anarkali slit at the waist. Even the round, closed collar is a unique neck design to try. Sonali Bendre brings together mirror work that is one the many ethnic legacies of India with the sort of coat, giving us a gorgeous coat-style anarkali. It is something bound to catch everyone’s eyes.